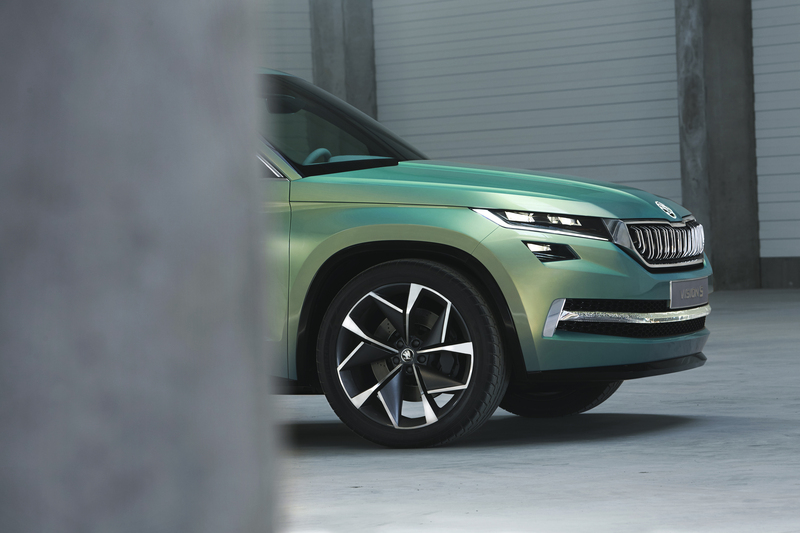 At a secret location deep in the Czech Republic, a hand-picked group of British journalists have arrived on a mission – to view ŠKODA’s VisionS concept car and the shape of SUVs to come. Our reporter goes undercover to observe the press pack, and test drive the prototype for himself. What I am about to tell you is top secret.” The commissioning editor pinned me with a suspicious glare. “You mustn’t tell anyone. Can I trust you?” I nodded, nervously. It began to dawn on me that this was no ordinary writing assignment. As he continued, the instructions sounded more and more like a secret agent’s mission, and less like a writer’s brief. “You will fly to Prague,” he said. 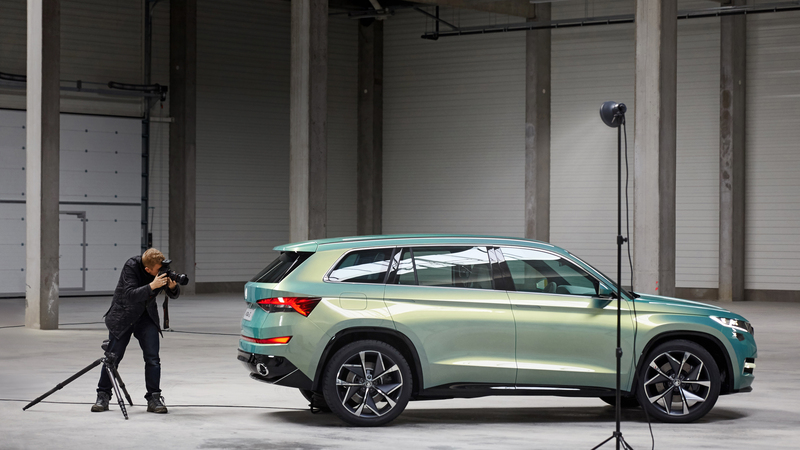 “There you will pick up a car and drive to Mladá Boleslav, the home of ŠKODA. You will receive the precise location of your liaison when you are on the road. At Mlada, you will be met by a man called Štěpán. He will take you to a warehouse where the new VisionS concept car is being housed for the day. 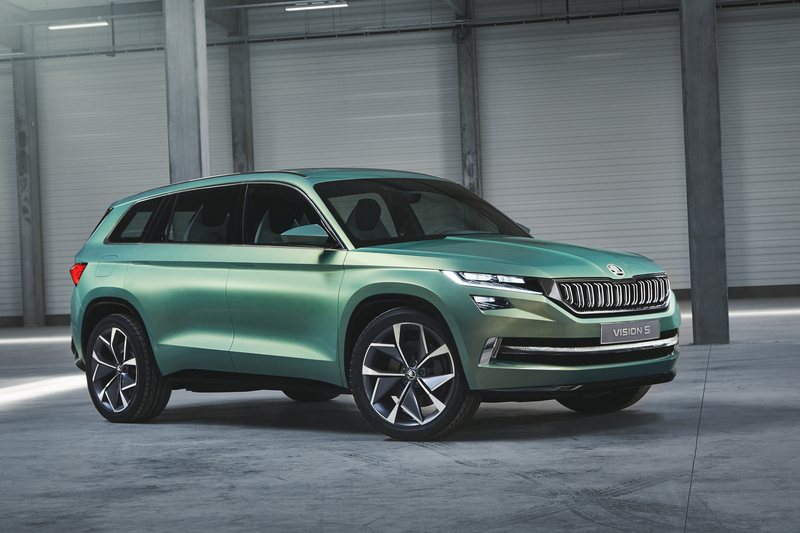 It is ŠKODA’s model for its future SUV release. Your job is to meet the UK journalists who are going to be test driving it. Find out what they think, and report back to me. Get some pictures. Oh, and the highly classified name of the new SUV when it is released,” he lowered his voice, “will be XXXXXX.” Sorry, I have to censor that bit. Top secret, obviously. For me, a writer new to the ways of the auto world, this all felt a bit James Bond. But as I sped along the highway from Prague to Mladá Boleslav, I have to say I felt excited and had lots of questions. Would I get to drive this VisionS? What would the UK journalists make of it? Was it full of Bond-style gadgets? Did it have an ejector seat? And most importantly, what the hell is a “concept car”? While I was turning all that over, my phone pinged. I fumbled to read the message wondering why nobody had yet figured out how to sync an SMS with the car dashboard. It was Stepan. What I saw took my breath away. It was like a vision of the future. Stepan and I made rendezvous just outside Mladá Boleslav. I followed him along a half-built road into what looked like a construction site, with a warehouse in the middle. Builders in hi-vis jackets were all over the place. At least, I think they were builders. Maybe they were ŠKODA’s security detail. Stepan swung the warehouse door open and what I saw took my breath away. It was like a vision of the future. Shining and beautiful in iridescent green, its skin seemed to shimmer. It was as if an alien transport had just landed. The VisionS. I found myself drawn towards it and reached out my hands. “Stop!” cried Stepan. Too late. My hands touched the door where the handle should be and a slender hand-grip slowly extruded, inviting me to open the door. But before I could get any further, a muscly bald-headed man, a sort of Czech Oddjob, stopped me. Stanislaw, or Stan as he told me to call him, was the car’s minder. And Stepan said Stan he would kill me if I damaged it in any way. He was joking. I think. 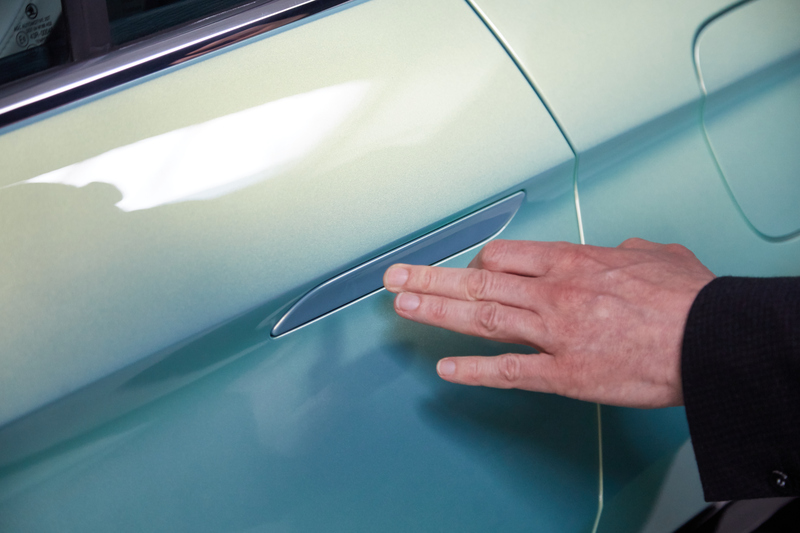 I stepped back from the car and a woman appeared with a red duster and removed my fingerprints from the paintwork. The VisionS was unveiled at the Geneva Motor Show in March 2016. 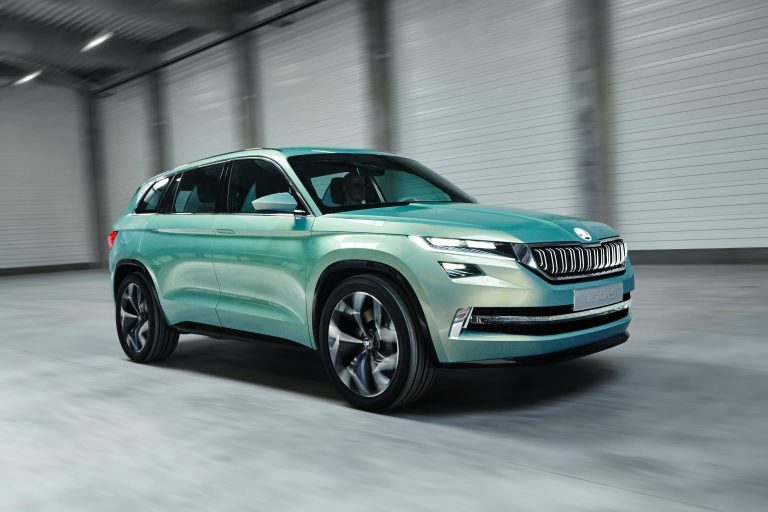 The one-of-a-kind concept car was back in the Czech Republic for just a few days before being transported to Beijing, China. “After this it’s going directly to Beijing,” Stepan said, “so we have to be really careful or we’re in big trouble. Let’s talk about it first and wait for the journalists to arrive.” We wandered over to the VIP catering area. We were sipping coffee, sampling delicate pastries and admiring the VisionS from a distance, when the door burst open. Laden with laptops, iPads and carry-on luggage, in breezed the UK press corps. John McIlroy of Auto Express, Richard Bremner of Autocar and Rob Gill of The Sun, along with their photographers, had raced up from Prague and were eager to see the car. Like me, they made straight for it, but unlike me they showed a little bit more restraint. “The green is beautiful,” gasped John in awe. “Yes, that’s very special,” said Stepan. “It’s like a chameleon. They had to paint every bit of it at the same angle to get that effect.” Meanwhile Richard admired the front end. 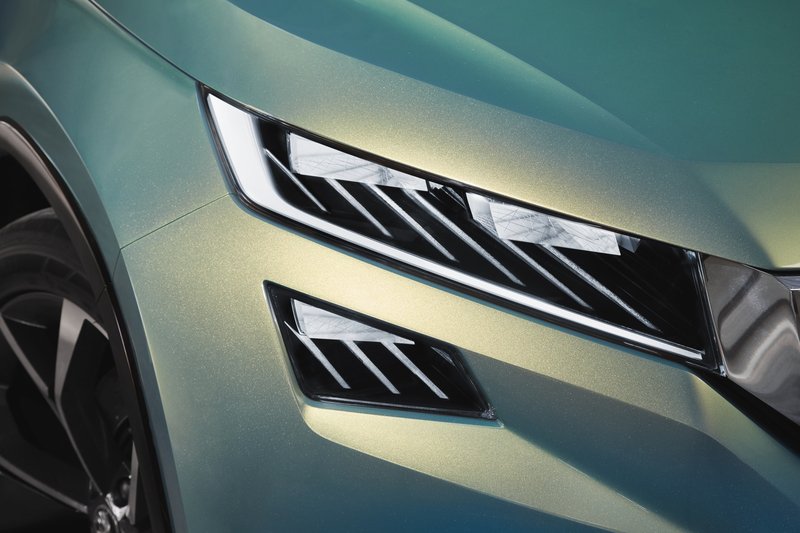 “Look at that double grille,” he said. “Bohemian crystal glass,” answered Stepan, proudly. Rob, meanwhile, was discreetly instructing his photographer to take pictures of the door handle I had tried to open. Stepan started to talk about the car, and his words magnetically drew Rob, Richard and John back towards him. Notebooks flipped open; they were consuming the facts. Sales figures. Production sites. What the Chinese market means. A plug-in-hybrid electric vehicle by 2020. 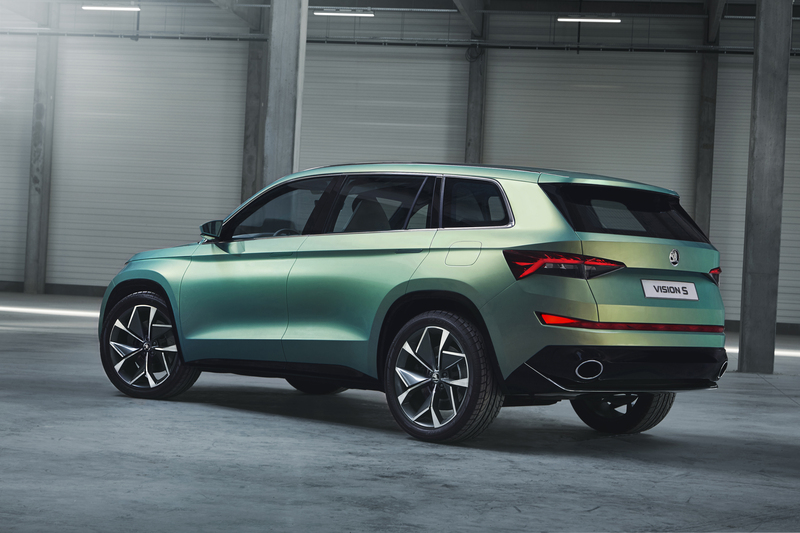 I get lost in all the detailed talk of “powertrain”, “MQB” and “torque”, but their excitement at ŠKODA’s SUV breakthrough was palpable. “What will it be called?” asked John. “We are not releasing the name before the beginning of May. But it won’t be the Snowman,” joked Stepan, and they all laughed. I wasn’t sure why. But I smiled to myself for another reason: I knew something they didn’t. Richard from Autocar broke away from the group and was slowly walking around the car, admiring every detail. I joined him wanting to show off what I knew: the top secret name. “I like the direction the styling is going in. This is really crisp and distinctive,” he said. 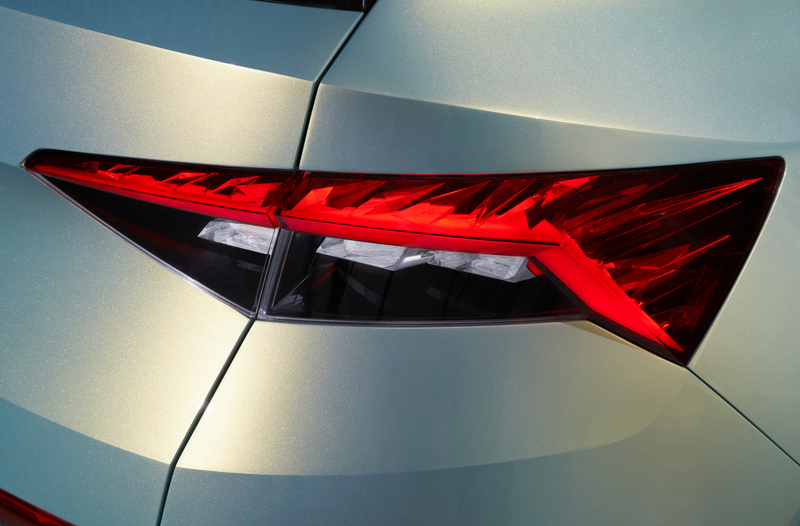 Shining concept for a new SUV The paintwork on the VisionS is dazzling, but that’s only half the story. 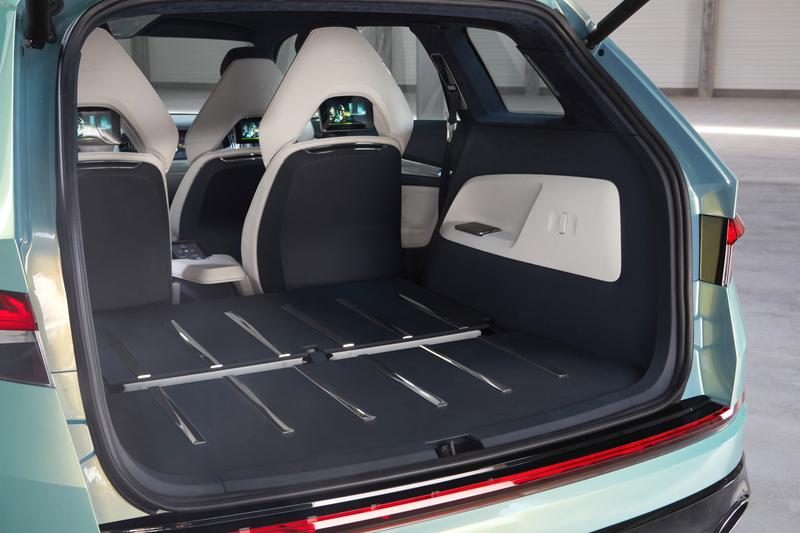 Inside it is roomy, luxurious, and fully equipped for a more connected driving experience. It’s a one-off. It probably cost a million, and it’s ŠKODA’s lighthouse for the future. Marwan Khiat (right) talks to the assembled journalists about the design decisions that went into the making of the VisionS. Marwan took us all back to the car and opened the door to reveal the cavernous interior. Plush white leather-looking quilted seats: six of them. Crystal glass embedded in the doors, ceiling and gearshift lit up to give the cabin a glacially stylish atmosphere. But what everyone immediately commented on were the multiple screens, and in particular the two huge dashboard screens for driver and passenger. It looked like a cockpit. A pilot’s console. 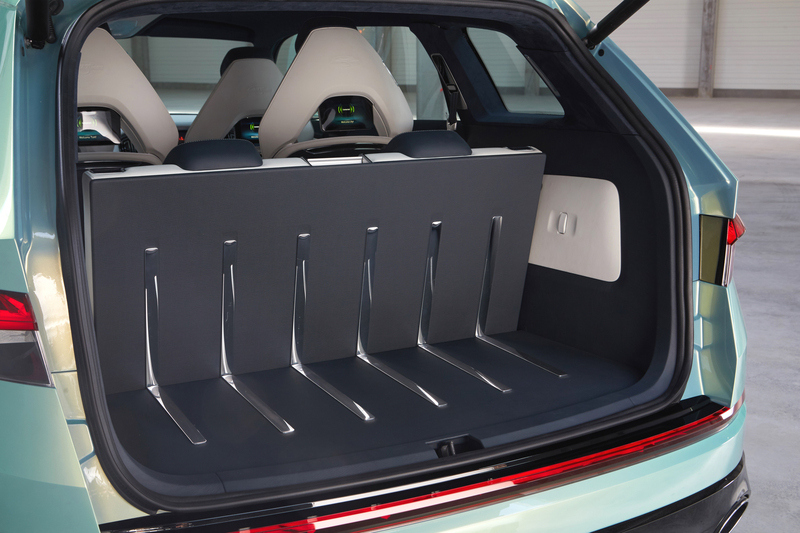 Will both screens be in the SUV on release? 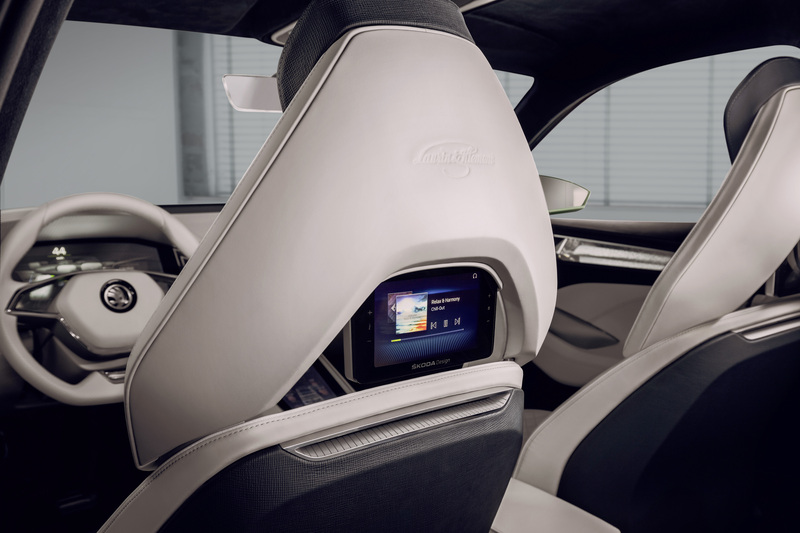 “No, there won’t be a second screen, but,” he added mysteriously, “there will be a special feature in front of the passenger. 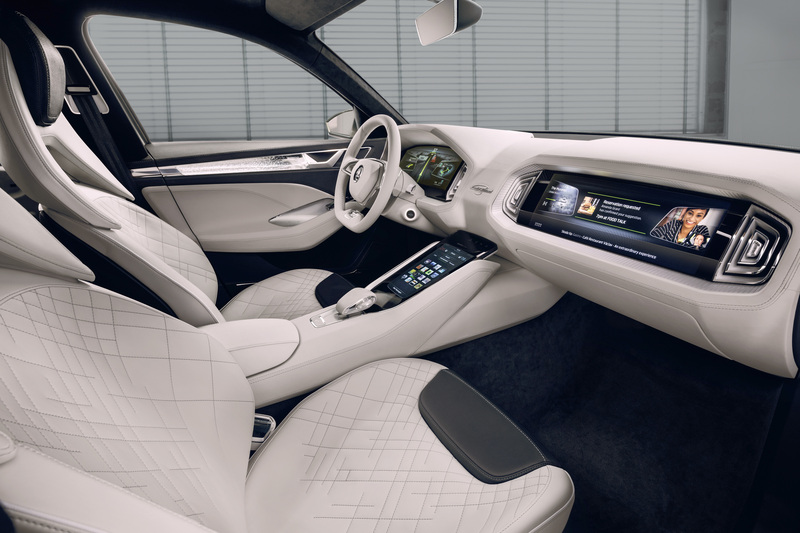 I can’t tell you what it is yet, but it’s not too long until the Paris Motor Show, is it?” What about all the other screens and the wireless mobile phone docking stations at every seat? That question led Marwan to talk about the absolute connectivity they are after for the future. The idea, he said, was for each passenger to be in their own “bubble” where they can control their own visual media and music. The driver’s and passengers’ text messages and email will ping up on their screens or dashboard. You will be able to access the internet and passengers will be able to exchange digital information and message each other. 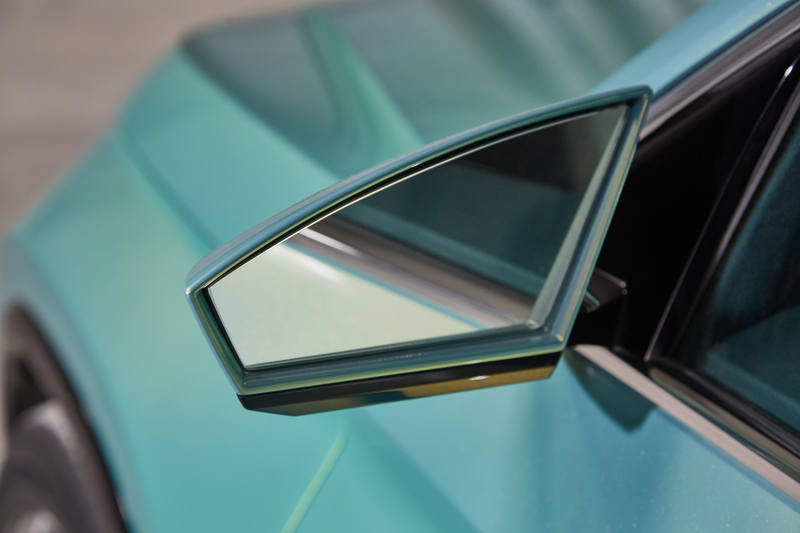 He hopes the crystal glass details will stay for future models, and the odd-shaped wing mirrors, because those themes, which have driven this concept, are so totally Czech: Bohemian glass and Cubist design. 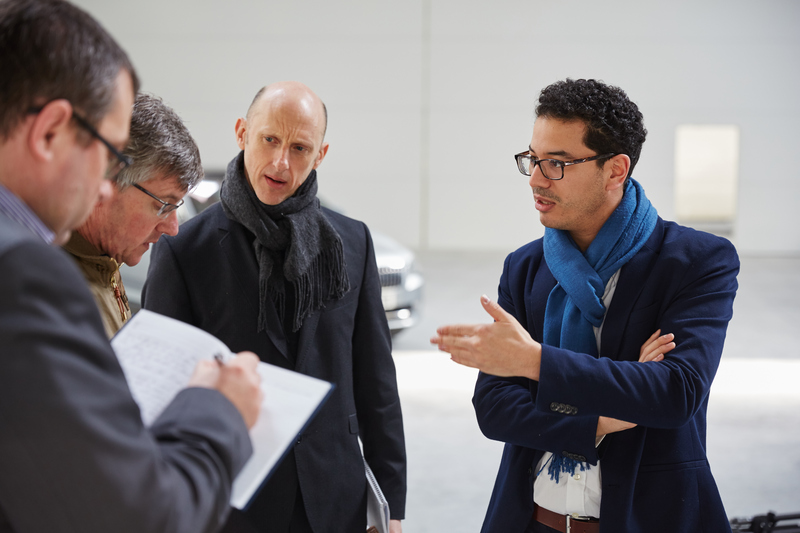 Marwan Khiat (left) tells Richard Bremner (centre) and our reporter Mark (right) about the upright double grille which will be a feature of future SUVs. This one is embedded with Czech crystal glass. He also talked about how, in the future, the car will become automated in a traffic jam so that you could, for example, read a book or Skype someone from the driver’s seat while the car does all the work. But what about the here and now? The journalists were keen to get on with their test drives. John was up first. As he positioned himself behind the wheel, Richard noticed that John’s green socks were an almost perfect match for the paint tone. “Did you know something we didn’t?” he joked. John laughed, carefully closing the car door. After a few circuits of the warehouse without crashing into the pillars he emerged with a beaming smile. What was it like? “Great! Commanding! Super visibility!” He seemed almost lost for words. Rob, too, emerged from his drive with nothing but praise for Marwan and the design team. “I think you’ve got a brilliant proposition there. It’s a game-changer. It makes a statement.” His words left Marwan visibly proud. The young designer then walked around the car with me, both of us admiring the piano-black wheel arches. He told me it’s a hand-made car. A real one-off. And then it was my turn to drive it. My stomach fluttered. Marwan Khiat is an interior designer and worked with a small team on the VisionS cabin. The moment has come. Stan opens the door for me, warning me not to slam it shut. He explains how to use the gear shift. I tell him I’m nervous. “That’s normal, just don’t damage it,” he says, leaving me alone in the cockpit. I look at the console. There’s a readout of my heartbeat (fast) and blood pressure. It even has my personalised music settings. 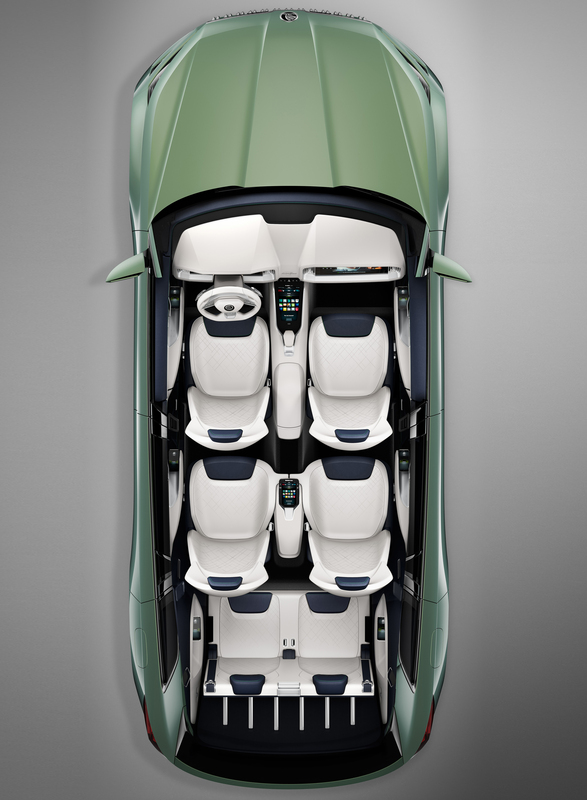 The glass panels light up and glow on the doors and ceiling, on the console, even on the trimming of the seats – all of which highlight the elegant shape of the interior. I feel as if I am in another world, a crystalline world. I slowly put my foot on the accelerator and the vehicle glides effortlessly forwards with an electric-powered engine. Silent. Easy. And as I drive it I simply can’t wipe the smile off my face. I feel like a million dollars, in a million-dollar car. It is as if I am driving into the future. The four doors were adorned with stunning Czech crystal glass, which lit up beautifully and also weighed over a kilogram in each door. The VisionS sets out the ambition for SUVs to come, which will in future use electric power to drive. The journalists all felt that this model was a game-changer in terms of practicality, design detail and price.